pH is the measurement of water quality. Soil or water can be too acidic or too alkaline. A pH of 7 is neutral. In general plants respond best to a pH between 5.5 and 6.5 for maximum nutrient absorbency. pH-Up and pH-Down adjust the acid/alkaline balance of your water. pH that is either too high or low will prevent plants from absorbing nutrients. One of the most overlooked aspects in effective gardening is pH. Without the proper pH balance, plants will not efficiently uptake nutrients. pH is measured on a scale of 1-14, 7 being neutral, less than 7 being acidic and above 7 considered a base. Here are some examples; pure water has a pH of 7, bleach has a pH of 13 and lemon juice has a pH of 2. Technical: pH has to do with the number of hydrogen ions. In water (H2O), there are a small number of molecules that dissociate or split up. These molecules loose a hydrogen ion and become hydroxyl ions (OH-). The lost hydrogen ion joins with other molecules to become hydronium ions (H3O+). In pure water, there is an equal number of hydrogen ions and hydroxyl ions which makes a pH of 7. In an acid, which has a pH of less than 7, there are more hydrogen ions. In a base, the opposite is true. The pH scale is logarithmic, which means that for each value change in pH there is a tenfold change in the number of hydrogen/hydroxyl ions. In other words a solution with a pH of 6.0 is ten times more acidic than a solution with a value of 7.0. When pH is not at the proper levels, a plant will lose its ability to absorb the essential elements required for healthy growth. This is why pH is so important. With X Nutrients pH Up and pH Down, you can easily adjust the pH to produce optimum growth results. Generally most plants prefer a slightly acidic environment, ranging from 5.8 - 6.5. When pH starts rising above 6.5, some of the nutrients will precipitate, or fall out of the solution, and stick to the walls of the reservoir. For example, iron will fall out of solution completely at a pH of 8.0. So if you are using a solution with a pH of 8.0, your plants will never get iron regardless of how much you use. Left uncorrected, this will result in an iron deficiency, slow growth, and eventually death. 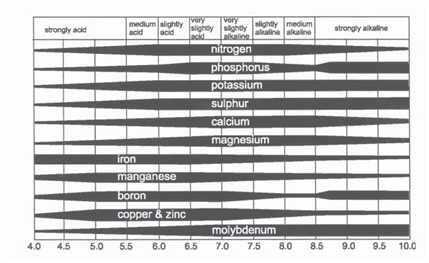 Below is a chart that shows some various elements and the effect pH has on absorption. You will notice that the greatest absorption of nutrients occurs from 5.8 - 6.5. Proper pH is especially important in hydroponic environments due to the fact that the plants are sitting in the same water for a long period of time. Alternative mediums such as various soils, coco, and rockwool, offer pH buffering making it more forgiving and offering a higher rate of success where pH is not constantly being monitored. Nonetheless, pH needs to be adjusted to ensure proper nutrient uptake. Checking pH in a nutrient solution is very easy. There are paper test strips, which are the most inexpensive way to check pH. These strips contain a dye that changes color according to pH. The most technical way to measure pH is a digital meter. There are various types available on the market with a wide range of prices depending on their accuracy and other features. Digital pH meters should be calibrated often as they tend to drift over time. Most pH meters should never be allowed to dry out and should be stored using a storage or buffer solution. X Nutrients pH Up and pH Down make it easy to adjust pH. Simply use the recommended dosage found on the label to increase or decrease pH. Make sure you are constantly monitoring the pH as you add more. What makes X Nutrients pH Up and pH Down a good product to work with is that we use a mid range concentration that makes it easy to dial in your ph to the perfect level. Higher concentration pH products are available on the market; however these products, due to their strength, tend to cost more and are difficult to work with. The higher concentration means that a little amount makes a huge difference in pH, and as a result your pH swings back and forth as you try to adjust it. X Nutrients pH is available in quarts, gallons, 2.5gal, 5gal, and 15 and 55 gallon drums.